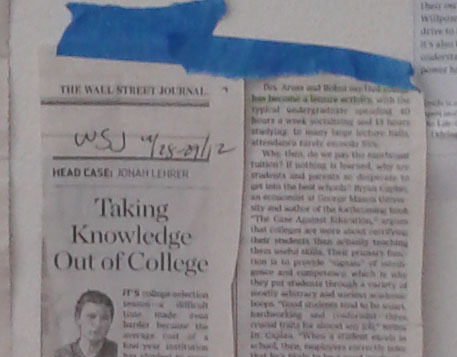 In my office, I have some newspaper clippings taped to the wall. One of them has been there a few years, a column by Jonah Lehrer in The Wall Street Journal called “Taking Knowledge Out of College” (2012). Such traits often predict success in the real world better than I.Q. scores. And yet, colleges don’t even attempt to improve them. Students are never taught how to regulate their emotions or study for a test. They don’t learn how to take criticism or cope with failure…. [T]he modern university teaches follow-through only by accident, forcing students to take tedious classes and then rewarding those who don’t drop out. I clipped the article because of a sense of solidarity. The pre-school analogy has a certain appeal to me: I think we should aim to teach students truly useful skills and not simply what is hard, rigorous, or historically taught. In the primary grades, I think it is more important for student to learn to stand in line cooperatively than it is for them to learn beautiful handwriting. In my own college, I think it is more important for our undergraduate business students to learn how to use Excel well than it is for them to learn calculus. Elsewhere on this blog, I did argue that it’s not always obvious to students which topics from a class will be useful. The students can’t possibly be expected to instinctively know all the applications of the material we are teaching. However, we professors should know how the ideas and skills in our courses could be useful on the different paths our students take. Given that those paths are constantly changing, it’s an ongoing job for us to keep current on the links between our class material and its potential uses. Even though I initially agreed with the article, upon rereading it, I found the suggestions frustrating and vague. Lehrer wants us to teach students how to regulate emotions and take criticism. I’m reasonably creative in the classroom, but it’s hard to imagine how we would teach those things, much less how we would measure whether we had successfully taught them. And, to a certain extent, the structure of school, with class meetings and graded tests and assignments, affords students opportunities to regulate emotions and take criticism. i wished school had prepared me better for…little things like how to deal with a crazy boss or how to tell your sales force they’re gonna miss out on a big commission because you can’t swing the discount they promised to a customer. Basically how to deal with people you’re gonna piss off. I’m happy that this alum has the self-awareness to realize that these are important things to get right. But I’m perplexed about how one would teach these things in school. Maybe we should have the students dealing with more crazy professors to get used to the crazy bosses?! I’m guessing that is not what he had in mind. I’m not an apologist for every wart in higher education. I think there are a lot of ways that we can do better. But I think criticism that we “don’t even attempt to improve” the most important traits in students is unfounded. And if I think of way to teach students how to “deal with people [they’re] gonna piss off,” I will let you know!